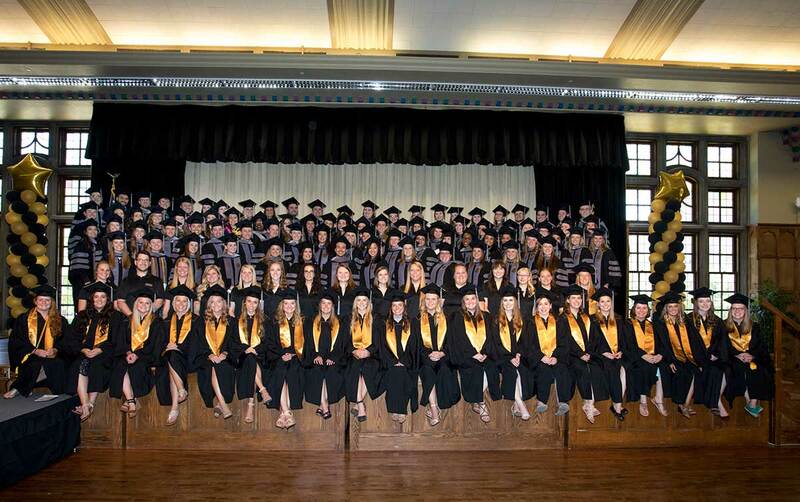 Congratulations to Purdue Veterinary Medicine's Class of 2017! The Purdue Memorial Union North Ballroom provided the setting for Purdue Veterinary Medicine's unified Doctor of Veterinary Medicine and Veterinary Technology Oath Ceremony, which followed the main university commencement exercises in the Elliott Hall of Music Sunday morning, May 14. Accompanied by family and friends, the new PVM graduates made their way from the Hall of Music to the Purdue Memorial Union in time for the Oath Ceremony to start at midday. Dean Willie Reed began the ceremony by expressing the importance of the occasion. "Today is a very special day, not only because graduation is such a significant occasion, but also because we are continuing a ceremony that builds on a long-held and beloved tradition of our College," Dean Reed said. "Since our first class graduated in 1963, we have held the Veterinarian's Oath Ceremony in conjunction with the main university commencement exercises in May." Dean Reed went on to explain how, in the mid-1970s, the College started the Purdue Veterinary Technology Program to educate the "nurses" in the veterinary profession, who are referred to as veterinary technicians. Since 1976, when the first class of veterinary technician students graduated, the College also has conducted the Veterinary Technician Oath Ceremony. "At Purdue, it is our goal to educate the entire veterinary medical team and promote an inclusive and cohesive team," Dean Reed said. "In recognition of that goal, we have unified the oath ceremonies for veterinary technicians and veterinarians in one program, which we are excited to conduct today. Through this unified ceremony, we are uniquely able to exemplify the concept of the veterinary team for all who celebrate with us." The dean then introduced two special guests who addressed the degree candidates: Purdue Veterinary Alumni Association President Keith Kitson Logue (PU DVM '80), and the President of the Indiana Veterinary Medical Association Maria Cooper (PU DVM 2011). Following their comments, the dean recognized the Veterinary Technology Program graduates. "Purdue University is one of a select few veterinary technology programs that offers both bachelor and associate degrees in veterinary technology," Dean Reed said. The entry point to the veterinary technology profession is the two-year Associate in Applied Science degree, which requires completion of a rigorous curriculum accredited by the American Veterinary Medical Association. Students who complete an additional two years of education, in which they learn and develop a deeper understanding of veterinary medical related diseases, diagnostics, advanced nursing skills, and team management skills, earn the Bachelor of Science degree. Saying the College is very proud of the Veterinary Technology Program graduates, Dean Reed then invited Class Responder Devan Barger, BS, RVT, to speak on their behalf. As the ceremony continued, each of the Veterinary Technology Program graduates were introduced and called onto the stage, beginning with the associate degree graduates, who have completed either the on-campus program, or the Veterinary Technology Distance Learning Program. The associate degree graduates are eligible to become registered veterinary technicians upon passing the veterinary technician national examination. They each received a Purdue University veterinary technician pin as they came onto the stage. Then the baccalaureate degree graduates were recognized, also being introduced individually as they ascended the stage. "These students are to be commended for achieving the 'technologist' level in the veterinary medical profession," Dean Reed said. "Graduates, your charge is to set the visible standard for what a Purdue University veterinary technologist is and does. In so doing, you will pave the way for all those graduates who will follow behind you." With all the Veterinary Technology Program graduates assembled on stage, the dean introduced Jennifer Ashley, veterinary technologist senior instructor, as the one selected by the students to lead them in reciting the Veterinary Technician's Oath. "The recitation of the oath of ethical conduct symbolizes your acceptance into the veterinary technology profession," Dean Reed said. "The oath signifies our high regard for the ethical standards and legal regulations governing the practice of veterinary technology, our strong commitment to the highest standards of patient care and client service, and our dedication to the animals that we serve." After reciting the Veterinary Technician's Oath, the Veterinary Technology Program graduates exited the stage and Dean Reed turned his attention to the DVM Class of 2017. "Today the Class of 2017 becomes the 55th Purdue DVM class to celebrate commencement and take the Veterinarian's Oath," Dean Reed explained. "Our faculty has witnessed your transformation from junior colleagues with high ideals and aspirations, to full-fledged veterinary professionals…You understand your responsibilities to the profession, to your colleagues and most importantly, to the people and animals you will serve. We believe that you are indeed ready to assume your new role as veterinarians." The dean then provided an opportunity for Ryan Klobusnik of Fishers, Ind., to speak as the class member selected by his peers to give the class response, before the DVM graduates were introduced individually and called to the stage. After the entire class assembled on risers, Dean Reed led the recitation of the Veterinarian's Oath. The program concluded with all the Veterinary Technology Program graduates being called back to the stage for a professional photo of the entire PVM Class of 2017, before the graduates and guests headed to a reception in the South Ballroom. Photos of the Oath Ceremony were taken by professional photographer Ed Lausch and are available on his website to be viewed and purchased online at www.lauschphotography.com. Enter the Username "2017graduation" and the Password "14may2017" to view the photos. I solemnly swear to use my scientific knowledge and skills for the benefit of society through the protection of animal health and welfare, the prevention and relief of animal suffering, the conservation of animal resources, the promotion of public health, and the advancement of medical knowledge. I dedicate myself to serve as a member of the modern veterinary team, as together we serve the needs of mankind, animal welfare, and our community. Working in a clinical practice, research, or industry, I will faithfully abide by all laws, regulations, and ethical codes that govern veterinary technicians. I will conduct myself in a manner which inspires the respect and confidence of my employer, colleagues, and the public. I will seek the mutual exchange of counsel and assistance with the clinical staff when it appears that the quality of service will be improved. I will strive to better my skills by keeping current my knowledge of new methods and ideas and by maintaining an open mind. Since the veterinary technician is a member of a professional team entrusted with the responsibility of the care and well-being of the animal kingdom, I make this oath with utmost sincerity and devotion.